Just like in "The Wind Waker", you can collect figurines which represent the characters and enemies you meet in the game. 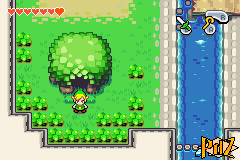 As soon as you own the Cane of Pacci, you can go to the Figurine Shop located in the southwest of Hyrule Town. Get in the cafe, use the Cane of Pacci on the vase, shrink on it, then go out, cross the river on the plank to the west, enter the house in the north from behind, grow back to your usual size, get out and enter the tree in the south. 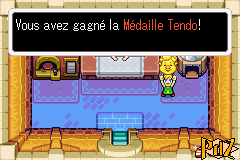 The owner offers you to trade some Mysterious Shells for figurines. Decide how many shells you want to bet. In the beginning, 1 or 2 shells are enough, but later you'll have to bet more. Keep in mind that you can only win a figurine if you've already met the character in question during your quest. It would then be better to go regularly to the Shop, so you don't lose shells in the process (you can only hold a maximum of 999 of them). Once you've won the complete collection of Carlov's figurines, the owner gives you Carlov Medal. You can then go see the rich man who's eating in front of the cafe of Hyrule Town. He allows you to enter his house and take whatever you like. Then go into the house right above him, open the chests and get a Piece of Heart. Inside, there is also a phonograph which allows you to listen to the game's music! And here is thanks to Aidman, the complete table of Carlov's Figurines!